Handout and activity on reading and responding to different types of essay prompts. Directly from the Essay Apprentice Writing System. 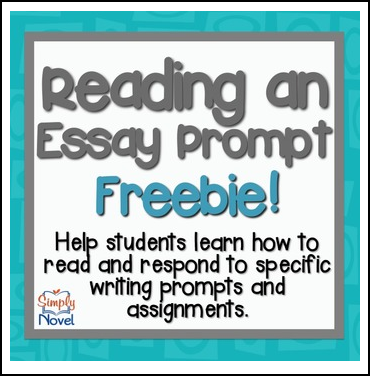 Works best for those students who are really struggling with writing and need some assistance responding to essay prompts for writing assessments. Be sure to check out our other Common Core Aligned products for Grades 6-12 here on TPT! Thanks for stopping by, and if you do decide to purchase, please do not forget to leave feedback. We are very interested in hearing your thoughts about our products! Also, don't forget to "FOLLOW" us for exciting new product announcements, sales, promotions, and more! For teaching tips, advice, and more, please follow our BLOG! PLEASE NOTE THAT SIMPLY NOVEL, AKA SECONDARY SOLUTIONS, AKA ELEMENTARY SOLUTIONS, HAS OFFICIALLY COPYRIGHTED THIS MATERIAL. AS SUCH, THE PRODUCT IS SOLD IN A LOCKED PDF FORMAT, AND THE ABILITY TO COPY AND PASTE HAS BEEN DISABLED. THIS PRODUCT IS LICENSED FOR ONE TEACHER, WHO MAY MAKE AS MANY COPIES/REPRODUCTIONS AS NEEDED FOR HIS/HER CLASSROOM USE ONLY. POSTING THESE MATERIALS ON THE INTERNET FOR OTHERS TO VIEW OR ACCESS IS A VIOLATION OF COPYRIGHT. FOR QUESTIONS OR CONCERNS, PLEASE CONTACT US BEFORE PURCHASING.